Looking for an Optometrist in Gold Canyon? 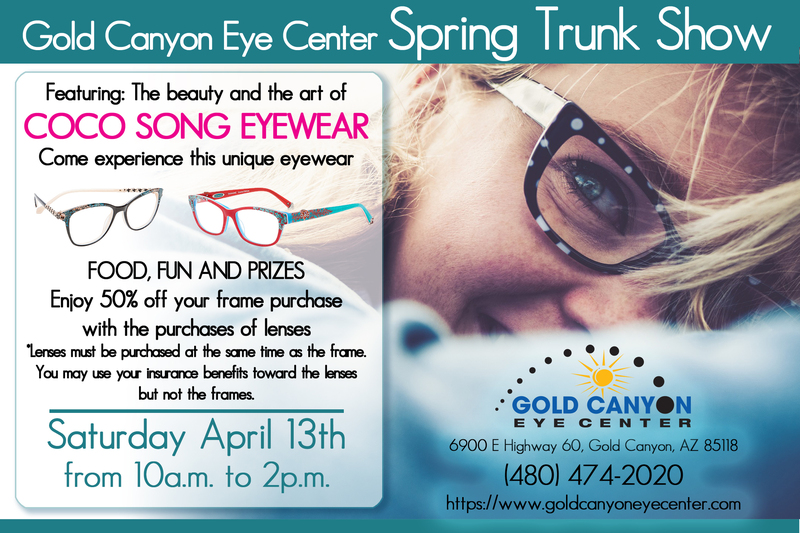 Turn to Gold Canyon Eye Center! An optometrist, better known as an eye doctor, can help you with a variety of eye issues. The most common reason why people visit an optometrist is to get glasses or contacts, but an eye doctor offers many other services beyond this. Here at Gold Canyon Eye Center, we offer a range of eye services to help ensure your eyes remain healthy. Here is more about us! At Gold Canyon Eye Center, keeping your eyes healthy and functional is our goal. In addition to routine eye examinations for glasses and contacts, we also provide red eye examinations and medical management of different eye diseases. We can monitor eye conditions such as cataracts, macular degeneration, glaucoma, keratoconus, and diabetes. Dr. Cheng specializes in pediatric optometry and Dr. Carlson specializes in specialty contact lenses including scleral contact lenses. Scleral contact lenses can be used to help patients with keratoconus, radial keratotomy (RK) and other corneal issues. Dr. Carlson is also familiar with corneal cross-linking and can discuss whether this would be a good option for you. We are a full optical center with trained/certified opticians. Our opticians will help you select frames, lenses, or sunglasses to help you see your very best. We have a wide selection of frames to choose from and only offer top of the line lenses and coatings. Our opticians are even able to help with glasses adjustments and minor repairs. It is recommended that all patients have their eyes examined yearly for a routine eye examination. If you are experiencing red eyes, watery eyes, flashes/floaters, pain, or a big decrease in your vision, that may warrant a non-routine medical visit. When you need your eyes examined for any reason, contact us here at Gold Canyon Eye Center. We will be happy to help you! While there are many optometrists that you can turn to when you need eye care services, we would love for you to turn to us here at Gold Canyon Eye Care Center. Our staff is made up of optometrists and opticians who will work closely with you to help you with all your eye care needs. The doctors will take the time to explain all eye conditions with you and available treatment options. Our opticians will talk to you about how you can benefit from different lens options in your glasses. We understand how important your sight is; let us show you how to protect it! Whether you need an appointment for routine eye exams or medical optometry services, here at Gold Canyon Eye Center, Dr. Carlson and Dr. Cheng can help you. Call us today at (480) 474-2020 to schedule your appointment today. Dr. Carlson is an honors graduate of the Michigan College of Optometry and holds a BA in Biology with honors from Ferris State University. He moved to Arizona in 2005 from Illinois to escape the cold and build a practice. Dr. Cheng completed her undergraduate education at U.C. Berkeley and went on to get her degree in Optometry at the Southern California College of Optometry. Hello, I’m Charlene. I am the front desk coordinator/receptionist. My responsibilities include greeting and checking-in patients, scheduling appointments and verifying insurance coverage. Hello, I’m Dawn. I have been an American Board of Opticianry certified Optician for 26 years. My favorite part of the job is the frames. I love to look for new styles and help patients update their looks. Hi, I’m Stacy. I’m new to Gold Canyon Eye Center. I’ve been an optometry tech for 9 years and love every minute of it! I’m from Nebraska but have been in Arizona for 29 years. I’ve been married for 10 years and have two beautiful girls. "If you don't live in Gold Canyon, it is worth the drive. The Eye Center got me in right away to examine worrisome issues with my eye. The office is clean and inviting. Everyone working there is professional, friendly, pleasant and helpful. Dr. Carlson was thorough and detailed and explained everything clearly and precise. I highly recommend this eye care center." "Dr. Cheng is very thorough, keeps copious notes and is very attentive. She explained everything to me and made sure I understood everything about my eye health." "As a result of RK surgery 25 years ago, my cornea ~ left eye ~ was concave making corrections difficult and inadequate. I thank my lucky stars that I was guided to Dr. Carlson at the Gold Canyon Eye Center. He fitted me with Scleral lenses that now have me back to crisp 20/20 vision. He is thorough and concerned about making sure everything is working as it should. Couldn't ask for better care. The support from his staff makes each visit a pleasure. A huge thank you from the bottom of my heart!" "I found Dr. Cheng to be pleasantly informative and very simple to understand in her explanations of what the tests were for, why it was important to do them and how to keep and maintain my personal eye health. I highly recommend making Dr. Cheng your eye doctor for yourself and your family as well." "Great staff!! Love these guys everyone is very helpful and personable!! Dr Carlson is so thorough and takes time to really explain things! ( the "how's and whys") He is just a kind, down to earth kind of Doc and has a fun laugh!! Don't be fooled by the fact that he looks like he's only 20!! He's been in the eye business for many years and knows his stuff! If you're looking for an eye Dr. don't hesitate for a moment! They also have a great selection of magazines in the waiting area but you never wait long enough to finish reading!! Gold Canyon Eye Center Rocks!!!" "Both Dr Carlson & Dr Cheng are so nice & professional. The staff are outstanding. Very happy to bring our business here. Highly recommend them!"